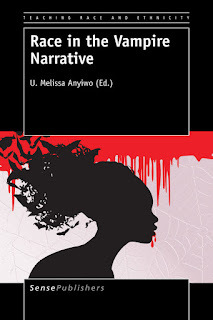 The Blurb: Race in the Vampire Narrative unpacks the vampire through a collection of classroom ready original essays that explicitly connect this archetypal outsider to studies in race, ethnicity, and identity. Through essays about the first recorded vampire craze, television shows True Blood, and Being Human, movies like Blade Trinity and Underworld, to the presentation of vampires of colour in romance novels, graphic novels, on stage and beyond, this text will open doorways to discussions about Otherness in any setting, serving as an alternative way to explore marginality through a framework that welcomes all students into the conversation. Vampires began as terrors, nightmares, the most horrifying of creatures; now they are sparkly antiheroes more likely to kill your dog than drink you to death; commodified, absorbed, and defanged. Race in the Vampire Narrative demonstrates that the vampire serves as a core metaphor for the constructions of race, and the ways in which we identify, manufacture, and commodify marginalized groups. By drawing together disparate discussions of non-white vampires in popular culture, the collection illustrates the ways in which vampires can be used to explicitly help students understand ethnicity in the modern world making this the perfect companion text to any course from First Year Studies, Sociology, History, Cultural Studies, Women's Studies, Criminal Justice, and so much more. The review: In the same range and a year older than Gender in the Vampire Narrative, this felt a slimmer volume but did much right. There were the odd little moments, such as when Á G Marín suggests that, “Before Bram Stoker and the Dracula mythology, in fact, the stereotypical vampire was not the pale, elegant Central European aristocrat, but a plump, swollen, brownish-skinned Slavic peasant”, which is frankly poppycock. Stoker clearly continued a tradition common through that century of the vampire being a pale, sometimes elegant (sometimes not) European (not necessarily central) Aristocrat that was sparked by Polidori’s the Vampyre and was popularised on stage and through prose. Be that as it may, this was a brief slip in an otherwise excellent volume – bar two larger issues. I felt Christi Cook, in “There’s No Place Like Home” did her own work a disservice as she concentrated on two Young Adult texts including Estrella’s Quinceañera. Whilst I have not read the text my understanding, and the impression I took from the article, is that it is not a vampire text, not even a supernatural text. As such, giving it prominence in a vampire reference work (as opposed to a work on Race in the Young Adult genre) seemed misplaced. The other issue – and I guess it is one more of interpretation – was with David Magill’s “Racial Hybridity and the Reconstruction of White Masculinity in Underworld”. Magill drew a racial comparator between the vampires (white) and the lycans (black) and I can see the argument. For me, however, the first film (especially) is actually not a race narrative but a class narrative with the vampires being the bourgeoisie and the lycans the proletariat. The progression of the lower class from slaves/serfs to lower/working class and the eugenic/holocaust aspect drawn in the deathdealers can have a racial aspect, it is true. However, to make that the sole focus of the argument there are aspects that need to be addressed within the argument, namely that the weapon master of the deathdealers, Khan (Robbie Gee), is portrayed by a black actor and whilst the primary warrior of the Lycans, Raze (Kevin Grevioux), is black, the leader of the lycans, Lucian (Michael Sheen), is white. This, at the very least, should have been addressed in the argument. That said, the writing was strong, the subject matter interesting and it is a valuable volume for the student of the genre. 8 out of 10.